Everything old turns new again, and ski poles are no exception. 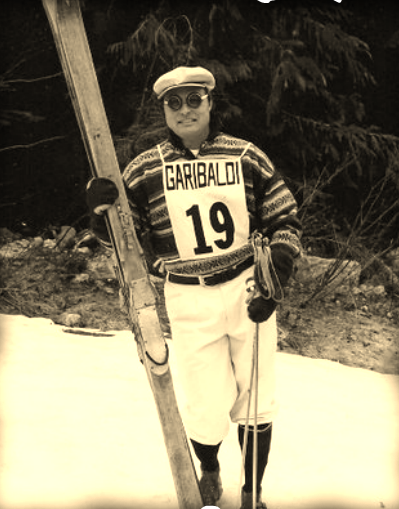 First manufactured out of bamboo in the early days of skiing, ski pole construction switched to steel, and then aluminum in the late 1950s. Today poles can be made from any of these materials, or from more costly composites like carbon fibre or graphite. Or, they can be made from bamboo. Blake Andreassen is a lifelong skier, coach and FIS Technical Delegate whose interest has been piqued by ski history and antique ski poles in particular. On display in his Squamish car dealership, clients began to take an interest in the prototype poles. The popularity of his poles is a combination of nostalgia, environmental consideration, practicality and funky style. “It’s an old, antique looking ski pole and it’s very green, and it’s sort of retro looking. Most people ski with aluminum ski poles; if you fall on it, or bend it, it kinks and it breaks. The bottom part gets thrown in the bush, and it’s an environmental disaster, and now you have a sharp weapon in your hand and you have to head down the mountain and get a new pair. With the bamboo, if it breaks, it just sort of splinters and you put a bit of duct tape around it and you can probably finish the day skiing with the broken pole. And even if it does get thrown in the bush it’s going to rot and fall apart,” explains Andreassen. Andreassen manufactures the poles himself, in small quantities. He uses bamboo for the shafts, plastic powder baskets and cork handles. Lately word has gotten out about these retro poles, and Andreassen is working to keep up with demand. Closer to home, Sun Peaks local Peter Smith acquired a pair and likes the new feel. The poles are being sold through Andreassen directly, and at McSporties at Sun Peaks.